* Mounting on symetrical or dissymetrical DIN tracks with adaptators G1. 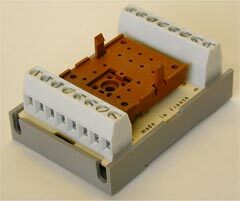 * Connection : screw terminals for multiwires of 2.5 mm² dimension (up to 4 mm² in one wire). EVB/GE socket is a front wiring socket with screw terminals for relays of 1800 and GE series. See detaile dindication regarding withdrawal in the technical support pages of this site.